Bible contradictions, categorically found throughout the Scriptures, are in fact riddles, even parables, that speak just as much as Yahshua’s own parables spoke. Certainly, either the Bible is God’s word and the contradictions are intentional parables, or it is the words of man and rightfully cannot be trusted as inerrant. There are no other choices. Gary addresses these riddles, for the first time making sense of the very things skeptics and critics have used in order to besmirch and cast doubt. 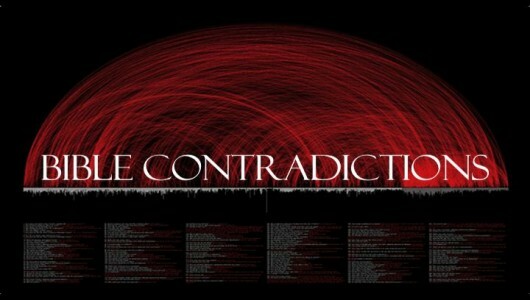 About the image: The red-line backdrop you see here is part of a very large chart titled “Contradictions in the Bible.” It was commissioned by Sam Harris, founder of Project Reason and author of The End of Faith, a criticism of religious belief. Each one of the 439 red lines marks a Bible contradiction between two passages. The gray vertical lines represent the 1,189 chapters of the Bible. Below that would be the various Scripture references. It is widely cited on the web. Click here to view in full.